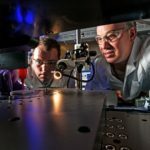 The U.S. Army Research Laboratory has teamed up with the University of Texas, Austin, and other regional universities to establish a new facility that will advance science and technology research projects in support of the Army of 2050 and the Defense Department’s Third Offset Strategy. ARL South will be based at UT Austin and will focus on materials technology research through co-location and collaboration between ARL and university scientists and engineers as part of the research lab’s Open Campus program, ARL said Wednesday. Philip Perconti, acting ARL director, said ARL South will focus on additive manufacturing, energy and power, biosciences, intelligent systems and cyber sciences, among other research areas. “ARL’s plan is to locate research staff at key locations in the U.S. such as the south central region,” Perconti said. “This extension of ARL to the nation’s innovation hubs will allow us to establish new relationships with other researchers in academia and industry,” he added.